Eight agriculture students from North Central Missouri College participated in the Missouri Postsecondary Agriculture Student Organization (PAS) State Conference November 15-17 in Neosho, Missouri at Crowder College. 120 students, advisors, and guests from seven Missouri community colleges and universities participated in the conference. The NCMC group had the opportunity to travel to the Bear Hallow Ranch and Preserve in Jane, Missouri for an agriculture industry tour. Conference delegates also voted on an organizational name change from post-secondary to professional agriculture students to align with the national organization. Students attending the conference were Katie Blanchard, Lucerne, MO, Jacob Butler, Cameron, MO, Breanna Chambers, Spickard, MO, Padyn Gibson, Trenton, MO, Alyssa Kosse, Trenton, MO, Jamee Scearce, Stewartsville, MO, Joel Sporleder, Unionville, MO, and Rylee Stokes, Brighton, MO. NCMC students who qualified for national competition have the opportunity to compete at the National PAS Conference in Loveland, Colorado next March. The North Central Missouri College Agriculture Department offers Associate in Applied Science and Associate in Arts transfer degree programs, which emphasize Agriculture Natural Resources, Ag Business, Crop Production, Livestock and Equine Management. 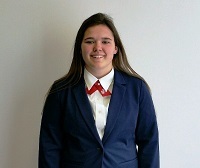 Padyn Gibson from Trenton, MO was elected as the 2018-2019 Missouri PAS Parliamentarian. Photo 1: NCMC PAS students recently participated in the Missouri PAS State Conference (F-L to R) Joel Sporleder, Padyn Gibson, Jamee Scearce. (B-L to R) Breanna Chamberes, Katie Blanchard, Alyssa Kosse, Rylee Stokes, Jacob Butler. Photo 2: Padyn Gibson has been elected as the 2018-2019 Missouri PAS State Parliamentarian.